Growing up, I spent many happy hours parked on a chair in my grandmother’s converted sunporch. There I happily explored her bookshelves that were packed with copies of Reader’s Digest’s Condensed Books. Opening each hefty copy felt gave me the same excitement as opening a box of chocolates. Most of the authors were unknown to me. Often the subject matter was over my head. But always, always I found hours of reading pleasure on those pages. It’s the same with our new anthology series, Happy Homicides. My friend Linda Gordon Hengerer and I reached out to other cozy authors with an offer to compile and publish our work. In today’s crowded market, getting “found” by new readers has become more and more difficult. We figured that if we could offer a variety of cozy mysteries at a bargain basement price, all of us authors would benefit. The concept is working! 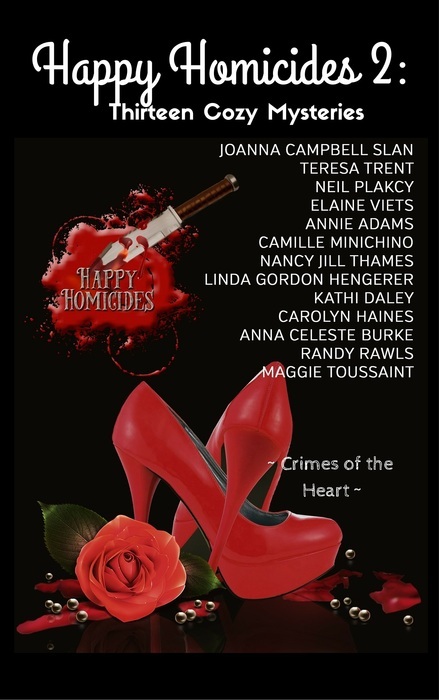 Our first anthology—Happy Homicides (1): Thirteen Cozy Holiday Mysteries became a bestseller in several Amazon categories. It also propelled a few of us into Amazon’s Top 100 Mystery Author list. 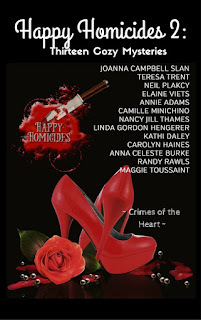 Now we’re on to Happy Homicides 2: Thirteen CozyMysteries/Crimes of the Heart. (Release date: Feb. 14, 2016) All of our authors wrote “whodunits” that explore that intersection of love and bad behavior. At only $2.99, it’s a bargain, thanks to 600-plus pages of reading material. As is our habit, we’re also including in the book an email address so readers can send away for a free bonus file of recipes and craft projects. Order your copy today! And yes, we have more traditional mystery anthologies on the way. Here’s our line-up of authors and their stories. Stupid Cupid: A CaraMia Delgatto Novella by Joanna Campbell Slan—Cara Mia’s search for love gets her involved in a star-crossed, homicidal romance. A Heart for Murder by Teresa Trent—An expensive family heirloom is stolen from a local jewelry store, and Betsy Livingston Fitzpatrick would love to figure out who’s responsible. For the Love of Dog by Neil Plakcy—A young woman’s death causes a man to consider the many aspects of love. Is it ever a justification for murder? Wedding Knife by Elaine Viets—A groom learns to take his vow–Till death do we part—very, very seriously. Death and a DozenRoses by Annie Adams—Plucky florist Rosie McKay is reunited with an old love, thanks to complications that happen when she tries to deliver a dozen roses. The Sodium Arrow by Camille Minichino—The love of a student for a favorite teacher drives a freelance embalmer to seek out justice. Sweets, Treats, andMurder by Nancy Jill Thames—Jillian Bradley is a widow with no children, but she still has a keen sense of family. Her love of a good mystery sets her and her canine companion, Teddy, on a quest for justice. Dying for Valentine’sTea: A Beach Tea Shop Novella by Linda Gordon Hengerer—The three Powell sisters want their friend Thelma to find true love, but they’re having trouble believing her fiancé has her best interests at heart. The New Normal by Kathi Daley—Even though her own dreams have been shattered, Ellie Davis finds it impossible to quit loving an old friend, even after he’s accused of murder. Bones and Arrows by Carolyn Haines—Intrepid Sarah Booth Delaney would rather face a gun than a party on Valentine’s Day. Not surprisingly, she’s decided that Cupid is a big phony. But is he a jewel thief, too? Murder at CatmmandoMountain: Georgie Shaw Cozy Mystery 1 by Anna Celeste Burke—Georgina Shaw loves her cat, chocolate, and cooking. When she’s framed for a crime, she’s forced to reconsider her priorities. The Missing Jacket by Randy Rawls—A golfing buddy offers Jonathan Boykin big money to retrieve a stolen jacket, but Jonathan suspects something else is going on. Jonathan is smart enough to discern the difference between love and lust. But can he also figure out the scam? Really, Truly Dead by Maggie Toussaint—Lindsey McKay has no desire to return to small town life. But her love for her father brings her back home when he’s accused of murder. I’m curious. Do you like anthologies? Did you ever read the Reader’s Digest Condensed books? How do you discover new authors?